USFK commander Gen. Leon J. LaPorte and his wife pay tribute to the deceased Dr. Underwood at the funeral home. 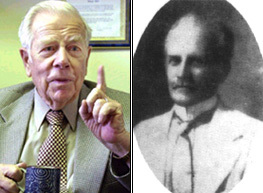 The grandson of arguably the nation's most famous American missionary and educator, who's family lived in and served for Korea for four consecutive generations, has died and will be buried in his "second father nation" that he and his clan loved so much. Dr. Horace Grant Underwood III (Koran name Won Il-Han: 元一漢), the third generation son of the founder of Yonsei University passed away at the age of 87 on Jan. 15, 2004. He died of natural causes at 11:20 a.m. Dr. Underwood was survived by his wife and three sons including Mr. Won Han Gwang, professor at Yonsei University. He was serving as director of Yonsei University until his death. Dr. Underwood started his career as an English lecturer Yonhui College, predecessor of Yonsei University in 1939. He spent most of his life here in Korea serving as a missionary. A funeral home is set up at the university's Ruth's Chapel for five-day funeral services. 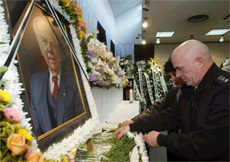 He will be buried at the Jeoldusan Cemetery for Foreigners in Hapjong-dong, Mapo-gu, western Seoul. For details call the president office of Yonsei University (02-2123-2001). Underwood was the grandson of the first Horace G. Underwood (Korean name Won Du-woo: 元杜尤), who arrived in Korea as a Presbyterian missionary in 1885, and began modern education in the nation. He was the first missionary from the Presbyterian Church to land in the "Hermit Kingdom." At age 26 Underwood I started teaching chemistry and physics, founding Youngshin School, predecessor of Kyung Shin High School in 1885. In 1915 with 52,000 dollars donated from his brother he established Chosun Christian College which later became Yonhui College, and eventually changed into Yonsei University. 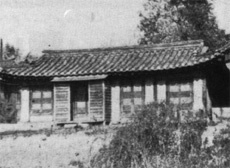 In 1887 he also founded Jongdong Church, precursor of Saemoonan Presbyterian Church. Horace Grant Underwood had one child, a son named Horace Horton Underwood (1890-1951). Horace Horton had six children, and the eldest of whom is Horace Grant Underwood (1917-2004). Born in Seoul in 1917 Dr. Underwood lived most of his life in Korea, his "second father country," just the way his grandfather and father did. He spent his university years in the United States. At age 16 he went to America for university education, coming back to Korea in 1939 as a missionary. He was forcibly driven out of the country in 1942 after Imperial Japan attacked Pear Harbor in Hawaii on Dec. 7, 1941. Korea was under Japanese colonial rule from 1910 till 1945. He then joined the U.S. Navy as an officer during the Pacific War. He was discharged from the Navy as a captain. In May 1946 he returned to Korea, started serving for the nation as a missionary. His missionary activities continued into the Korean War (1950-53). Hearing of the outbreak of the war at a prayer gathering in Daecheon Beach he decided to rejoin the U.S. Army to help defend his beloved Korea from the Communist aggression. As an intelligence officer questioning North Korean prisoners of war he used his linguistic ability fully in the Incheon amphibious landing operation. He spoke immaculate Korean and Japanese as well as English. Starting in July of 1951, he served as an interpreter during a series of foot-dragging, cease-fire tug of wars between the U.S. and North Korean forces. He was the one who witnessed the whole process of cease-fire negotiations which lasted nearly three years. Since then, Dr. Underwood dedicated his efforts to developing Korea's education. He worked as professor of Yonsei University, and served as director of Kyung Shin High School and Dae Kwang High School. In 1974 he sat on the board of directors of the university. He also held a host of social positions in sectors of education and international friendship, including vice chairman of Korean American Association, director of Gwangju Christian Hospital, advisor of the Korea America Friendship Society. 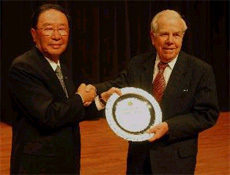 Dr. Underwoon received a number of awards from the government and society for his life-time contribution to Korean society. "Although I look like an American, Korean blood and sentiments are flowing in my body," he once said in an interview with a local newspaper.